Welcome to the Cultural Synergies February 2009 newsletter. 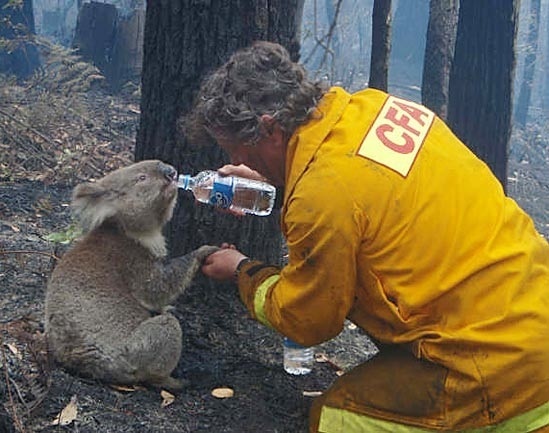 As news of the Victorian Bushfires in Australia has spread across the globe I have been astonished at the kindness and generosity shown to others, not just within Australia but from all over the world. It has been a dreadful week of devastation that has taken lives, homes and entire communities. Although there has been much doom and gloom of the GFC in recent months, the fires have highlighted for me the positive nature of globalisation: At times like this we are so fortunate to have such an interconnected world that allows us to offer assistance and demonstrate compassion and altruism no matter where we live. Over the past week Victorians have experienced firsthand the global community spirit that exists amongst us. My intention was to write about being �Other Aware� this month, following a conversation that I had with a friend. The recent bushfires have reinforced to me the significance of being �Other Aware� even further. During the Christmas period I spent some time with my extended family. A close friend of mine who joined us for a day, commented to me how impressed she was by my family�s awareness of each other�s needs. The age range of our children is varied, as are the needs of each family, particularly around meal times. As any of you with young children will know, unpredictability and flexibility are key essentials to any successful social occasion! My friend noticed that when we all came together everyone helped each other and compromised on activities and meals throughout the day to allow for all of us to enjoy the time together. I had never paid much attention to the dynamics of my family and what makes our get togethers so enjoyable until my friend pointed out her observations. I realised we have an unspoken consciousness of each others needs, we all live in different parts of the globe, so when we get together it is always for a finite time and we need to make the most of it. My family and the Victorian Bushfires got me to thinking about the importance of being �Other Aware�. By �Other Aware� I mean being aware of the needs of others and their situations. A greater understanding of others around us can give us a greater sense of empathy, improve communication and allow us to work together to achieve the best outcomes. As markets shrink, jobs are lost and natural disasters hit, it is imperative for all of us to be �Other Aware� so that we can interact with each other in the most effective way. Given the current global economic climate, I think it is fair to say that there is a high degree of anxiety in many workplaces. As organizations downsize and restructure their businesses many employees are being asked to do more with less. Being �Other Aware� can be seen as an essential ingredient in today�s best business practices. It can improve communication both local and cross culturally. Increased awareness of others can create greater engagement of people within organisations, improve team collaboration, improve leadership skills and enable a greater understanding of client requirements and improved client relationships. So how do we become or improve our awareness of others? Listen actively. Don�t be thinking about what your response will be otherwise the other party will not have your undivided attention. Ask questions. Questions give you the opportunity to clarify your understanding of the discussion and also reinforce that you were listening. Demonstrate your understanding further by paraphrasing some of the important points. This also allows for clarification of any misunderstandings. Being �Other Aware� is about having a sense of what is happening on the other side. Although we may not be directly involved in a situation, know people personally, or even be in the same continent, it is imperative to be understanding and aware of others needs and �where they are coming from�. It makes us more effective as individuals, employees and family members. We don�t have to agree with others attitudes or viewpoints but by listening, demonstrating interest and concern, we can improve our knowledge, develop empathy and respect thus raising our levels of understanding making us more effective individuals. Coaching For Emotional Intelligence: The Secret to Developing the Star Potential in Your Employees. (2007) AMACOM. This is a thoughtful, realistic and accessible guide that I recommend for not only mangers leading in the workplace but also for anyone who wants to learn more about Emotional Intelligence. It is a book about coaching individuals to develop their emotional intelligence, which Wall argues is a life-long journey. His approach is as much about personal discovery as it is about coaching others. He argues that the more we study the topic of emotional intelligence and apply what we learn to our own lives, the better we become at coaching and managing others to develop their emotional intelligence. I have both used in my own work and taught the coaching strategies that Wall discusses in his book. He provides a great step-by-step method and sample scripts for conducting coaching sessions. Techniques of how to both give and receive praise, how to empathize with others, and how to interact with colleagues and staff in ways that promote congenial working relationships, are just some of the emotional intelligence discussions. It helps develop being �Other Aware�. Cultural Synergies will be launching a new DVD/CD Set - "Tom Verghese on Sourcing Across Cultures" next month. �Raising Your Cultural IQ� explores the issues around culture, the challenges that culture can pose and provides some great strategies on how to leverage on cultural differences and similarities. Visit our website www.culturalsynergies.com nbsp;for more information.